UNSCENE! UNDISPUTED! is a high-stakes art competition in which teams are given a variety of challenges as they endeavor to create pieces of art that will impress the judges (52% of the vote) and the audience (48%). Eight teams will enter the arena at Millennium Film Studios on Sat, Aug 9, 5 pm to 11 pm, says Pam Atchison. The winning team will take home $10,000. The remainder of the competitors will be put to death on Douglas St.
#318Pinks: Kathryn Usher, Captain; Nadine Charity, Jerry Usher. The Atoms Family: Chris Baker, Captain; Julieann Banks, Courtney Gaston. "$10 gets you Entry and 10 votes for your favorite team," says Casey Jones. Where are the writers who can trenchantly take the public into a piece of art to emerge with fresh understanding and details heretofore unseen? The role and future of art criticism, a concern that arises only in a community that is high-minded and erudite, is the subject of a Shreveport Regional Arts Council symposium, Aug 6 - 9. It is called Conversations on Criticism: the Future of Writing on the Arts. Participants are art critic Robert L. Pincus, literary critic David L. Ulin, performing arts critic Anne Marie Welsh, Michael Killoren of the National Endowment for the Arts, Michael Granberry of the Dallas Morning News, and Alan English of the Shreveport Times, says Pam Atchison. The symposium will begin on Wed, August 6, at 5:30 pm with a welcome party for the Critics Series final exhibition, To Be Continued: The Power of Suggested Stories in the Art of Rachel Stuart-Haas, Joshua Chambers and Taffie Garsee. Also open will be Belle Mar: The Poetry of Katie Bickham, curated by literary critic David L. Ulin. 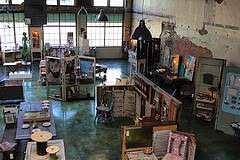 Event schedule and registration info: www.artspaceshreveport.com or 318-673-6535. Registration is $75, $40 for artists on the NWLA registry(artists must contact SRAC), and includes entry into all symposium events, meals and receptions. Included is admission to UnScene! Undisputed! on Sat, Aug 9, 5:30 pm, at Millennium Studios, 300 Douglas St.
Painting above is "Personal Passenger," by C. Mark Burt. Smoke-free entertainment venues in Louisiana: will Shreveport join the vanguard? Bears on Fairfield recently featured Papa Mali and Brady Blade, Jr, in a wailing show that was unusual by omission: no one in the crowded bar was smoking. While it had support from New Orleans radio station WWOZ, the initiative for a smoke-free evening came from www.healthierairforall.org. To sweeten the no-smoking pitch, WWOZ gave away shirts and stickers. Across the southern part of the Bayou State the smoke-free movement is gaining ground. Lafayette and New Orleans are leading Baton Rouge, it would seem. Btw, Fat Harry's, St Charles Ave, is listed as a non-smoking tavern; can that be true? The number of events listed as smoke-free in the decadent Crescent City is surprising: from the ReBirth Brass Band at Howlin' Wolf to the Charmaine Neville Band at Snug Harbor, you can go from music venue to venue and skip the smoke. Will this movement ever be viable in Shreveport? It is primarily designed to aid the men and women who serve drinks and food and make music in a state where those activities are a huge factor in tourism. Chase Boytim of Bears on Fairfield says he would be open to more smoke-free evenings. For the moment the only venue in Shreveport listed as smoke-free is On The Rocks, the lobby bar at the Hilton Convention Center. New Orleans lists over 100 venues as non-smoking. Baton Rouge has 34. All bars in Alexandria, Monroe and West Monroe are described as "100% smoke-free." In regards the health of Bayou State citizens, entities such as Blue Cross are promoting prevention as a strategy that makes more health sense and gives more economic advantage than hospitalization and late-development medication. And a new generation is learning a new way: state legislative Act 211, passed and signed, prohibits smoking on all public college campuses. Most Louisianians were raised to believe that smoking is a birth right. And they believe that smoking in bars is an inviolable item that is specifically protected by the constitution. Is that attitude negotiable? Is Louisiana capable of the reflection and debate that might lead to an alternative to smoke-filled taverns? If not, then Shreveport is capital of the contrarians. If yes, the city might experiment a bit more with "smoke-free" as an incentive to hit the town. Photos by M.C. Rollo of the Papa Mali gig. Before the giant Wayne White puppets strut - btw, there may be something at which to gawk at 6 pm - at 7:30 pm, people will gather on historic Texas Ave to party and shop for original art which is cheap ($10 - $20) in the Shipping Container Galleries. Lots to do at UnScene Wayne White, sponsored by the Shreveport regional Arts Council. The map below is from the event which was rained out, so not everything may apply. It remains a helpful graphic. From the fall of 1948 until the fall of 1950, Zeke Clements called Shreveport home. 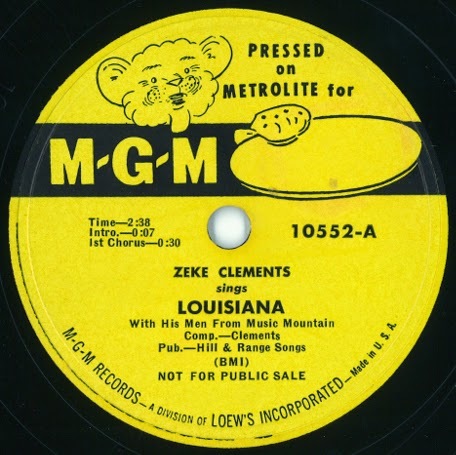 During this time, he hosted radio shows (music as well as news programs), performed on the Louisiana Hayride, and recorded this song about his “home sweet home” Louisiana. In addition to goods for sale, expect carefully rendered pop classics from the Recliners, Jim Huckabay and Bob Thompson, at the South Highlands Summer Market. The Recliners may be found near the fresh produce. Check around the tomatoes. Stephanie Fernanadez is the girl of a thousand faces. The art created by the 19 year-old painter, photographer and videographer is powerful enough to have won praise from Buzzfeed.com, Good Morning America, the Huffington Post, Cosmopolitan and other global media ports. Her fame has been won with faces transformed by color and line into otherworldly figures. Fernandez admits that much of her spectacularly colorful make-up work falls into the category of "colorful / creepy / gory." She says, "this style is influenced by my passion for horror movies & psychological thrillers." But she is even more influenced by music, says Fernandez and her friends. Says Justin Powell, "Music is very, very important to her. Images come from the world she hears. She channels the sound into her work." And musician friend Jeremy Hefner points out that a female duo called CocoRosie has been a big influence. In fact, Fernandez' best movie, "Rosalee," an ominous 12-minute piece featuring 8 silent actors (the seven deadly sins plus a heroine), uses 4 evocative CocoRosie songs as the soundtrack. "Most of my makeup is heavily influenced by music," she says. "I love to be able to create and see what I am hearing, if that makes sense. I hear it and I do my best to create a visual of what and how I feel. Other than music and movies-nature, dark art, psychedelic/pop surrealistic art, and other artists inspire me. I strive to constantly create beauty." That is apparent in the 4 tutorial videos she has produced. In the fast-forward camera work her hands work deftly, whether using fingers or brush. Colors are blended like butter. She asks, "How do I come up with these ideas and concepts? I simply see it in my mind’s eye and my hands do the rest. Haha; the ideas honestly just come to me. It is not something I can explain with words." "Big, open spaces and the colors found in nature are not so apparent but are important themes" in Fernandez' work, says friend and model Madison Brown. Pointing out a recent series of fawn faces accented with antlers, Brown sees subtlety, which is not how Fernandez has attracted media attention. That she is in the media spotlight may have something to do with her storytelling ability. A sharp photographer, Fernandez typically publishes 4 to 6 photos of steps leading to the finished image. On her vivid Instagram stream the self-described "complex individual" has some 55.000 followers. Yet she remains quiet and modest about her notoriety. "People who know her do not necessarily realize that she is so widely recognized," says Hefner. Her website, stephaniefernandezart.com, tells a more expanded story. She makes movies. She makes masks. She paints in acrylic. She says, " I would love to direct movies and creative direct music videos and well as open a studio to create SFX masks, canvas pieces, and many other mediums. I love the film, fashion, and music industries. I have no limits. My mind is constantly moving. I want to do it all." Note: Stephanie Fernandez graduated from Airline HS, Bossier City, and has taken media classes at Bossier Parish Community College. In art she is self taught. Artist C. Mark Burt, Bossier City, has created a new series of soft, terrabudial sculptures to accompany his intramodial paintings. Several sculptures will be part of the Chaos exhibit at Ro2 Gallery, Dallas. The annual exhibit opening is mobbed; Ro2 displays work by 100 artists in the small gallery. Ro2 Art Downtown Gallery, 110 North Akard Street Dallas, TX 75201. 7 - 10 pm. Jordan Roth, 214-803-9575 – jordan@ro2art.com. The Wayne White Puppet Parade will roll on Sat, July 12, 5:30 pm, in Shreveport Common, says Shreveport Regional Arts Council. Re-scheduled 2 weeks ago due to rain, the UnScene parade will feature dancers, drummers, stilt walkers and bands. The audience is encouraged to join the throng as the art and train of artists marches on Texas Ave and circumnavigates the streets around Central Artstation. In the puppet population will be Elvis, Hank Williams, Bonnie and Clyde, Annie McCune, Cora M. Allen, the Cajun alligator and additional personalities. While there, see the Shipping Container Galleries on Texas Ave, featuring the work of Nicola and Qean Balllard, painter Jormie Journell and sketcher Robert Trudeau. Catch E.E.M. United and Emily Daye’s “Racing Hearts” installation. There will be food trucks, too. The parade is free and appropriate for the whole family. Above is a typical Wayne White puppet - constructed by White alongside a team of local artists - featuring a Gothic Steamboat cruising into an extensive and humidity-laden cypress swamp. Shrek – Ron Walsorth, Young Shrek – Cameron Hunter, Young Fiona – Aubrey Woods, Teen Fiona – Hunter Todd, Mama Ogre – Katie Jones, Papa Ogre – Mike Crawford, Fiona - Amanda Ericson, King Harold/Pig #2 – Chris Schmoutz, Queen Lillian/ Dragonette– Holly McCart, Donkey – Cordara Newson, Farquaad – Bruce Wilson, Pinocchio – Cassidy Giddens, Gingy – Amanda Clark, White Rabbit – Dalton Randolph, Fairy Godmother – Lyric LaPlante, Peter Pan – Aubrey Buckner, Ugly Duckling – Julianne Bigham, Sugar Plum Fairy – Asia Brown, 3 Pigs – David McCart, Chris Schmoutz, Serdolyer Darden, 3 Blind Mice – Zoey Lex, Leslie Townsend, Shalem Johnson, Tweedle – Madison Lawrence, Humpty Dumpty – Brier DePriest, Wicked Witch – Claire Watson, Mama Bear – Barbara Holmes, Papa Bear/Thelonious - Luke Diligilormo, Baby Bear – Breyanna Flowers, Shoemaker’s Elf – Lisa Ann Kemper, Goldilocks – Katie Jacobsen, Jiminy Cricket – Olivia Burton, Little Bo Peep – Emma Cate Dailey, Little Red Riding Hood – Marguerite Papa, Dragon – Kelly Vaden. Dragonettes – Elise Birmingham, Tova Volchech, Holly McCart, Big Bad Wolf - Chris Gonzalez, Grumpy/Duloc Performer – Robert Lawrence, C aptain of the Guard – Patrick Nix, Guards - Jezek Maxwell, Jacob Middleton, Lee Jackson, Rick Bills, Pied Piper/Guard – Rick Bills, Bishop/Guard – Lee Jackson, Dulocan Greeter/Performers – Lacie and Leslie Johnson, Duloc Performers – Ellie Kate Jackson, Cara Timerding, Kelie Papas, Maddie Montgomery, Rebecca Kay, Lindsey Shanks, London Todd, Robert Montgomery, Happy People/Mob – Rebecca Kay, Lindsey Shanks, Ellie Lawrence, Maggie Guy, John Horton. Direction and choreography - Laura Beeman Nugent, Music direction - Adam Philley, Set design and technical director - Chris Gonzalez, Lighting design and dragon construction - David White, Stage manager - Allison Hannon, Assistant stage manager - Grant Rogers, Light board op - Ridley Walker, Sound board op - Travis Jones, Spotlight op - Madeline Collier, Running crew - Brennan Williams and Jamie Johnstone, Costume mistress - Peggy San Pedro, Props design/master - Gerry Castellani, Costume crew - Amy bills and Tosh Flowers. Tickets are $25 and will be reserved seating. Click "Buy Tickets Online" @ www.shreveportlittletheatre.com or SLT box office at 318-424-4439 or @ box office, noon - 4 pm weekdays and one hour before performances. "Celebrate the 2nd Annual Hamel's Better Beach Bash for an unforgettable July 5th outdoors," says Dionne Procell. - 9am sign-in and memorial to the 6 teens that drowned on the river in 2010. - Bayou2Bay will lead a beach trash sweep. - River Rocks Life will demo water safety and paddle sport play. - Sci-Port: Louisiana's Science Center will host a watershed learning station. - Rainforest Art Foundation will lead a trash art project. - Water playtime, including standup paddleboarding, canoeing and kayaking. Area paddling enthusiasts will provide water safety education and instruction. Courtney Thibault, owner of Louisiana Yoga and Paddle in Ruston, will be on-site to provide paddleboards and instruction. - Water and lavatory services will be provided. Food trucks will be available for lunch on-site. "The joint fundraiser is free to public w/suggested $1 or more donation. There will be prizes for unique refuse finds and drawings from water bottle registration. Bring the entire family," says Procell. The fluttering pages of a rudimentary book were recently painted atop one of Shreveport's most signal historic brick towers, the Shreveport Ice and Brewing Company building. It is probably not the graffiti of a local tagger. It is a symbol that has been painted on buildings coast to coast. "It has been part of the street scene in New Orleans for years," said a local source. It is the sign of a street writer or writers called Read More Books. Juxtapoz.com says, "Juggling between countless names, monikers, and cities, remaining elusive and off the radar, READ has been an effective force behind the graffiti of Read More Books," in a Dec article. Doug MacCash, arts writer for Nola.com, recognized a wave of Read writing in New Orleans in a 2009 post in which he said, " Gaia, a Brooklyn street artist, said that though he doesn't know Mr. READ (aka Read More Books or The Booker), he believes that the ambitious tagger has hit San Francisco, Cleveland and New York, as well as New Orleans." On the top of the 1904 Shreveport Ice and Brewing edifice there is an additional sign: a whistle. It is emblazoned with the initials WB. That may or may not refer to "whistle blower." Heliopolis's anonymous source added, "The whistle, which is also a national phenomenon, has been seen in downtown Shreveport recently." MacCash continued, "As an art critic, I've always been ambivalent about reviewing graffiti. On one hand, most graffiti remains more antisocial that artistic. On the other, graffiti is very fashionable these days, and, let's face it, way more people see it than ever cross the threshold of an art gallery or museum." "This week, in addition to our regular Tuesday and Saturday markets, we'll be presenting, along with KTBS, a Friday, 4th of July market," says Noma Fowler-Sandlin. "It will take place from 7 a.m. to noon, all tucked into the East Pavilion. It will be a little bigger than a Tuesday market, but still not as large as a Saturday one. See you there!" Shrapnel Stage Company will hold auditions for award-winning mystery The Other Place, says John F Daniel. Auditions are 2 pm to 5 pm Sunday July 6 and 6 pm to 9 pm Monday, July 7, at the East Bank Theatre, 630 Barksdale Blvd in Bossier City. Scripts are not available beforehand. The director would prefer everyone do a cold read, but all are welcome to look up articles and video clips of the show which are available online. Juliana: late 40's to mid 50's, The Woman: mid 20's to early 30's, The man: early to mid 30's and Ian: late 40's to mid 50's. The production will be directed by Daniel, a seasoned actor and director. Reach him at nitejonboy24@aol.com.